The Husqvarna H15 Elite-Cut #542774541 is used for general purpose, cured concrete, and brick a blade made for the pros. The Husqvarna Vari-Cut Turbo #586107801is designed for fast cutting on hard concrete,stone and masonry materials. 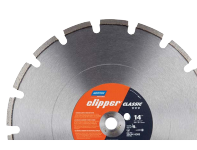 The Husqvarna Vari-Cut #542751359 is a general purpose blade designed for cured concrete and brick the perfect combination blade.